For a couple of weeks during October 2006, Mars and Earth will be on opposite sides of the Sun. Every day for the past decade, the U.S. has had a presence at Mars, using spacecraft to understand this extreme world and its potential as a past or present habitat for life. 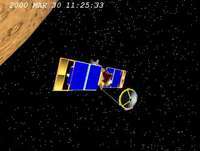 During that time, all spacecraft have become virtually incommunicado for about two weeks every two years. The reason is solar conjunction, which occurs again from October 18-29, 2006. Solar conjunction is the period when Earth and Mars, in their eternal march around the Sun, are obscured from each other by the fiery orb of the Sun itself. Like dancers on either side of a huge bonfire, the two planets are temporarily invisible to each other. Mission controllers at NASA's Jet Propulsion Laboratory respond in a variety of ways. They turn off some instruments. They collect data from others and store it. In some cases, they continue sending data to Earth, knowing that some data will be lost. Whether they get a break from everyday operations depends on what mission they're supporting. No one attempts to send new instructions to Mars during solar conjunction. It's impossible to predict what information might be lost due to interference from charged particles from the Sun, and that lost information could potentially endanger the spacecraft. Instead, prior to solar conjunction, engineers send two weeks worth of instructions and wait. Opportunity acquired images of clouds passing over Victoria Crater using the navigation camera on the rover's 950th sol (martian day) of exploration on Mars (Sept. 25, 2006). Both rovers will continue searching the Martian sky for clouds during solar conjunction. "We worry a little bit because it's always possible that something unexpected could happen," said Jake Matijevic, engineering team chief for NASA's Mars Exploration Rovers. "But, the rovers have made it through solar conjunction before and we think they'll be OK."
Mission planners have already sent detailed schedules of activities to the rovers. 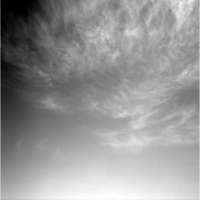 Spirit and Opportunity will scan the Martian sky for clouds, measure atmospheric dust, conduct chemical analysis of dust, rocks, and soils, and take pictures. Opportunity will join Spirit in staying put temporarily. Both rovers will store the data and transmit it to Earth later. Solar conjunction might even be an opportune time for some team members to take a few, well-deserved vacation days. 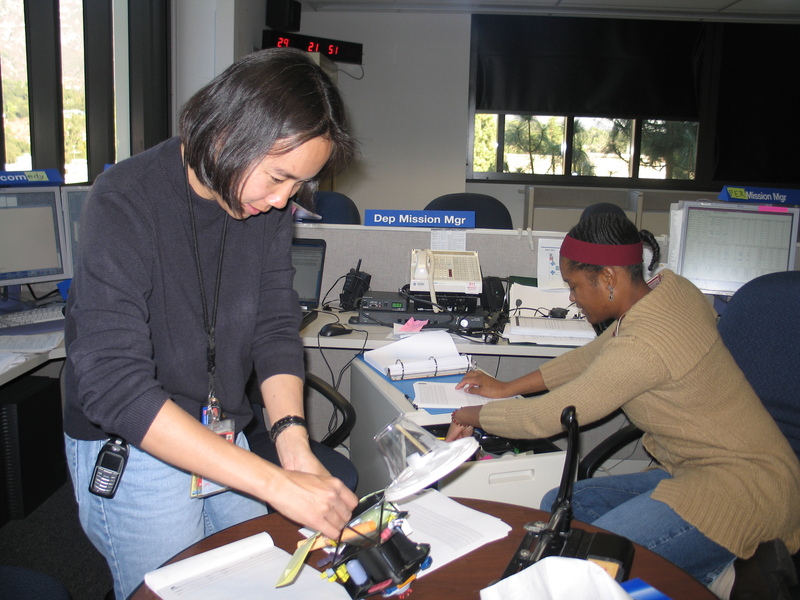 Ramona Tung studies a mockup of the Mars Reconnaissance Orbiter, while colleague Tracy Drain reviews data from the Shallow Radar instrument during Mars solar conjunction. Both women are engineers working on the mission. Team members made the model out of everyday objects, such as a plastic cup and baby bottle, to save wear and tear on a much more fragile, official model of the spacecraft. They use it to visualize the movement of the many components and instruments on the spacecraft before writing computer codes that tell the spacecraft what to do. Meanwhile, in an adjacent room, a team of scientists meets to discuss the Mars Climate Sounder, which continues operating during conjunction. ... Or Not to Rest? In contrast, it's hard for the Mars Reconnaissance Orbiter team to stay away. The newest mission to arrive at Mars, the orbiter recently began operating all of its instruments for the first time. The team is lining up to see some of the most detailed images of Mars ever returned, as well as new data that will likely rewrite our current understanding of the Martian environment. Though scientists will turn off the high-resolution camera during solar conjunction, some other instruments may still collect data. "The spacecraft is getting a break, but everyone on the ground is still working just as hard," said engineer Robert Sharrow, a system engineer at NASA's Jet Propulsion Laboratory. That's true for the Mars Odyssey team too, who may be busier than usual in coming weeks. "Solar conjunction is not typically looked at as time off," said Odyssey Science Office Manager Gaylon McSmith. "One of the things we'll be doing is getting ready to increase our global mapping coverage of Mars, using a technique known as off-nadir pointing." Starting in December, instead of keeping the spacecraft pointed straight down at the surface of Mars (nadir), navigators will rotate the spacecraft to collect stereo images -- slightly offset images of the same terrain. Like a pair of human eyes, the stereo views will enable Odyssey's thermal camera to perceive depth and the relative position of surface features. Odyssey will continue sending its own data to Earth and relaying data from NASA's two Mars rovers. Based on experience, Mars explorers know they will lose some data while Mars is behind the sun with respect to Earth. "After solar conjunction, we'll have a big cleanup job telling the rovers what information to re-transmit," said Matijevic. For a time, the dish antenna on Mars Global Surveyor did some careful maneuvering to stay in contact with Earth. These activities pose no problems for the pros. Mars Global Surveyor, the granddaddy of all spacecraft at Mars, has continously mapped Mars since 1999. Team members have solar conjunction down pat, and rest easier than in prior solar conjunctions, when an antenna problem caused some worries. For a long time, explained Project Manager Tom Thorpe, an obstruction limited the range of motion of the dish antenna that sends data to Earth. To get around the problem, navigators flip-flopped the spacecraft's high-gain antenna in a fairly complex procedure called a "Beta Supplement," which enabled them to point the dish at Earth. They had to be careful to keep the dish from hitting the boom that supports it. Suddenly, last year, the obstruction disappeared. Engineers concluded that the problem likely resulted from a kink in the cabling rather than, as some had originally thought, a loose screw that wiggled loose during launch. "This is our fifth solar conjunction and we've pretty much got it down to a science," Thorpe said. "We're in our 5th Mars year of sensing -- one Mars year is equal to almost 2 Earth years -- and we're still making new discoveries all the time."